Running is wildly popular in America. Cycling? Not so much. With new leaders at the helm of EF and USA Cycling, can cycling take a cue from foot races? You may have noticed a trend among two of American cycling’s largest institutions: Runners are now at the helm. Last month, EF Education First recruited a new team president to help Jonathan Vaughters manage its WorldTour cycling team. The big hire? Mary Wittenberg, former director of the New York City Marathon. Then, just two weeks ago, USA Cycling named its new CEO to follow in the footsteps of former pro rider Derek Bouchard-Hall. USAC looked outside the cycling world and chose Rob DeMartini, who helped build running shoe company New Balance into a global behemoth. Every year, America’s competitive cycling landscape inches further from its traditional model and closer to one that is found within the American running scene. You might have seen this trend in your own cycling community. There’s the proliferation of mass-start races like gran fondos, gravel races, and marathon mountain bike events, for starters. All of these events promise an adventure and personal challenge, rather than upgrade points on that long journey from Cat. 5 to Cat. 1. Within this collection of mass-start events are bucket-list races like the Dirty Kanza, Belgian Waffle Ride, Leadville 100 MTB and others. And some elite riders, who frequent these events, are able to generate a livable wage from personal endorsements, rather than seeking payment from an organized professional team. Similar dynamics have shaped the American running scene for decades. Take my word from it: I’m equal parts runner and cyclist these days, and I used to report on the U.S. running industry. In running, you find bucket-list marathons that attract tens of thousands of participants. Most runners seek a personal challenge and adventure, rather than some top result that elevates them to another tier of the sport. Some “pro” runners earn their keep due to one-on-one engagement with fans, rather than race wins. Running is not without its own challenges, of course, yet the sport’s overall picture is drool-worthy for those entrepreneurs and businesspeople within cycling. According to industry group Running USA, Americans recorded 18.3 million running race registrations in 2017, down slightly from 2016. Marathons in New York City, Chicago, and Boston continued to generate eight-figure revenues from a mix of corporate sponsorship, race registration fees, and expo sales. And the lion’s share of overall race participants across all events was female. A self-described casual cyclist, DeMartini believes America’s bike shops can learn from running shops’ experience in order to make the sport more enticing to newbies. The challenge: We’ve all been in bike shops that maintain an easygoing, no-attitude vibe. We’ve also been to shops that do not. With many shops struggling to accomplish the basics while simply staying alive, extras like customer service and that friendly attitude can take a hit. DeMartini told me that he wants USA Cycling to take more of a leadership role within the bike industry. So let’s wait and see if his running expertise helps bike shops cater to novices. Wittenberg helped build the New York City Marathon into one of the biggest running races on the planet. She said the race often invested sizable resources in promoting the elite athletes, and celebrity runners, who showed up to race each year. Sometimes that meant telling the rags-to-riches story of a world-class runner from Kenya; other times it meant helping Edison Peña, a Chilean miner who was stuck underground during the 2010 mining disaster, connect with New York City’s various media outlets. The challenge: Some races already market their pro riders quite well (Kudos to USA Crits), while other events lack the budget or media clout to move the proverbial needle in their respective communities. There are mass-participant events that prefer to focus on amateurs — whether pro riders show up or not is of little concern from a marketing standpoint. Perhaps this is an avenue where professional teams and regional races can combine their resources and know-how to blanked the marketing and PR push together. Of course, that would require coordination between everyone. Fluhme and his wife, Lidia, launched Gran Fondo NY in 2012, and since then the event has grown into the GFNY global series, with 19 events slated for 2019. Fluhme is also a bonafide endurance badass, and his marathon PR is 2:33 (that’s fast). Fluhme believes cycling events can learn from running events by targeting entire groups of participants, rather than just individuals. Perhaps events can even open registration up to entire clubs or groups of friends, rather than just solo registration. Fluhme says he sees this dynamic paying off at his races in Asia and Latin America, where participants register alongside their riding friends, rather than signing up solo. The challenge: Many bucket-list bike races have switched to a lottery-style registration system due to heightened demand, so creating a system to let whole groups of riders register could pose a challenge. Leadville 100, for instance, now offers group lottery entries to address this concern. But operators of regional gran fondos and gravel events could definitely market their respective events as fun group activities. Who knows, maybe they could offer a discount to groups of 10 or more. Harshbarger is the president of Running USA, the industry-funded group that tracks participation and distributes best practices information to event operators across the country, among other tasks. Harshbarger says American running traces much of its success to the proliferation of short 5km races, which serve as the entry point into the sport. In 2018, half of all running events were 5km races, and the distance had the highest percentage of female participants (62 percent) and the highest percentage of participants in the 18-24 age group. Long story short, 5km races are bringing women, young people, and new runners into the sport. The other beauty of the 5km is that organizers only need to shut down five kilometers worth of road, as opposed to a typical road cycling race. That doesn’t mean 5km events are cheaper to organize, Harshbarger says, however the 5km races boast very cheap entry fees. 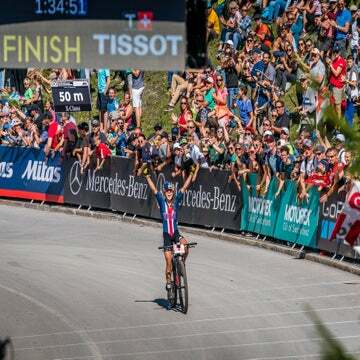 The challenge: What is cycling’s answer to the 5km race? I don’t think anyone has figured that out yet. Perhaps this is the Holy Grail that cycling should chase: An entry-level event that contains a spirit of competition (finish times, rankings); can be completed on an inexpensive bicycle; requires minimal road closures; and boasts an entry fee below $40. Oh, and you can hold it on Thanksgiving. 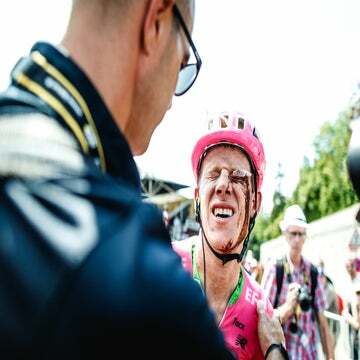 Commentary: Should EF Education First-Drapac send Craddock home?